Jeremiah was nearly 20 years old when he began to prophesy, and he continued in that office for the rest of his adult life, some 40 years or more. Because his message held little weight with the people, Jeremiah's prophecies reveal a substantial amount of emotional depth—often sorrow over the plight of God's people or his own troubles (Jeremiah 12:1–4; 15:10). Because Jeremiah prophesied in the final years of Judah before God's people were exiled to Babylon, it makes sense that the book's overarching theme is judgment. Indeed, the first 45 chapters focus primarily on the judgment coming to Judah because of its disbelief and disobedience. However, an element of grace is also present in these events. The fall of Jerusalem comes nearly nine hundred years after the original covenant between God and the Israelites in the Sinai desert (Exodus 24:1–18). Such an extended period of time witnesses to God's great patience and mercy, allowing His people the opportunity to turn from their sinful ways—a lifestyle they began not long after they struck the original covenant with God (32:1–35). 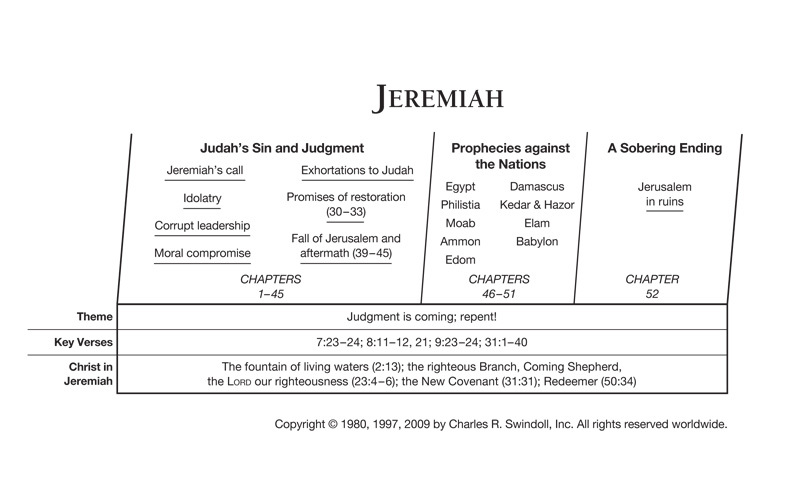 Find resources in the book of Jeremiah in our resource library.